The Outlier’s Guild Custom Motorcycle Show held its inaugural event with a myriad of motorcycle-centric sponsors, including Honda Motorcycles, Indian Motorcycles, Monster, Bell Helmets, Roland Sands Designs, WD40 and others. 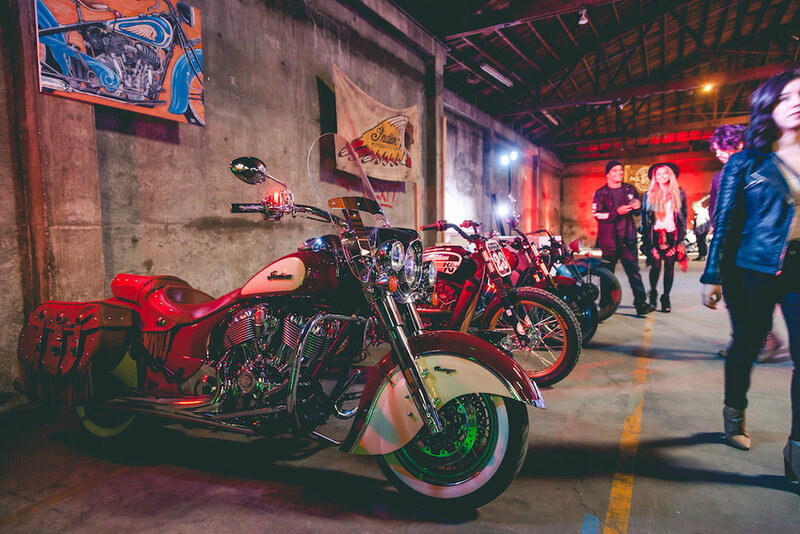 The occasion showcased the culture of vintage custom motorcycles juxtaposed with a mix of international mural artist's work. Displaying custom and modified bikes along with the work of artists and photographers inspired by motorcycle culture. Indian Motorcycles put together a creative installation of mannequins with explosions of colorful paint and texture delivered by burnouts of a vintage bike inside a shipping container. Free to the public, hundreds of motorcycle enthusiast attended to admire the works of prolific bike builders. Indian Motorcycles and Roland Sand concluded the event with a sweet artistic burnout. Aaron Guardado - Suicide Machine Co.
Samuel Kao - JSK Moto Co.